When we dropped by Ruby’s Bar on Friday, the sun was shining and then there was a sudden shower. Pretty soon the sun was shining again. A group of friends from Chicago, Florida and North Carolina led by a Bushwick native who’d brought them to see his Coney Island popped in for drinks. They posed for a souvenir snapshot in front of Ruby’s wall of photos. Melody, who opens Ruby’s around 10:30 am, says weekdays bring tourists from all over the world. Most of them ask why the rides aren’t open, but others are seeking rarer sights: “A group from Sweden came in the other day looking for the Elephant Hotel,” Melody said. They were more than a century too late to see the elephantine colossus, which burned down in 1896, but Coney Island is still worth a visit on an autumn day. 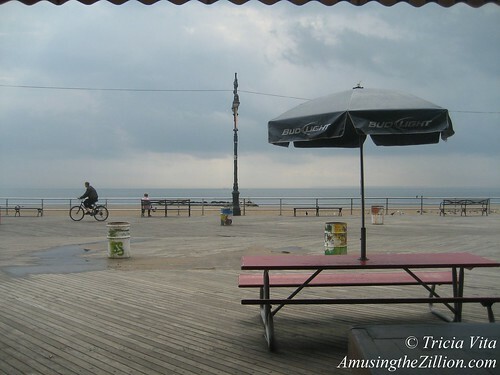 Coney Island’s beach and boardwalk and surviving landmarks– the Parachute Jump (Brooklyn’s Eiffel Tower), the Wonder Wheel, the Cyclone and the terra cotta palace that was Childs Restaurant–are always ready for their close-ups. After Labor Day, the rides and attractions at Coney’s amusement parks are on a weekend and holiday schedule. This week, the rides will spin for five days in a row, weather permitting. Deno’s Wonder Wheel Park, Luna Park, Scream Zone and the Cyclone will be open beginning on Wednesday for the start of the Sukkot holiday through Columbus Day. Great photo! Long live Ruby’s! Thanks, Marty — Cheers to Ruby’s and the Coney Island Boardwalk!